Woke up sad this morning for no apparent reason. Strange for me, a mostly joyful being, though I’m not one who has never experienced melancholy or even the dark pit of despair. But that was long ago and involved the implosion of my 30-year marriage to the father of my children and the man I believed was the love of my life. Understandable, right? Both experiences felt like an overwhelming sense of being weighted down. Of being crushed. And now, as if those indigo rain clouds hanging over Fairbanks had spilled their cargo into my dreams, I was drowning. And dang if she didn’t deliver! Sorrow is definitely situated close to joy on my emotional terrain. One step forward and, bang, I was out of Funklandia. The low bush cranberries did that for me. We of Swedish tradition call them lingonberries and make jam and syrup and drop them on our oatmeal. My mouth watered just looking at the darling white flowers, and the memory of my grandma stirring tiny red berries into her muffin batter made me feel loved. I snapped a picture, inhaled the crisp air and wandered deeper into the bush. There was no path cleared by human hands, and at the same time endless paths were implied by the lay of spruce and birch. As I meandered, bouquets of Alaskan bluebells popped up here and there, ringing silently in the wind. For me, it’s impossible to be glum in the presence of bluebells. Have you ever listened to Django Reinhardt on a rainy day? Well, both Django and bluebells make me want to dance! 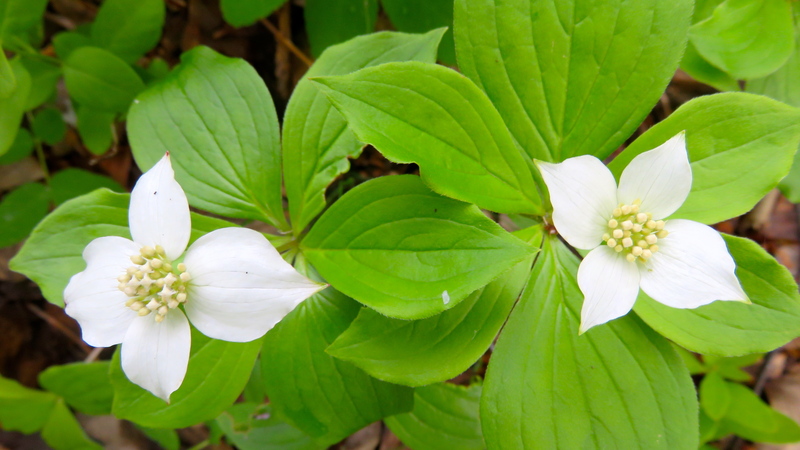 I twirled and whirled until I was dizzy through a pack of dwarf dogwoods barking like sled dogs from the forest floor. I sat down among them, became still, listened. 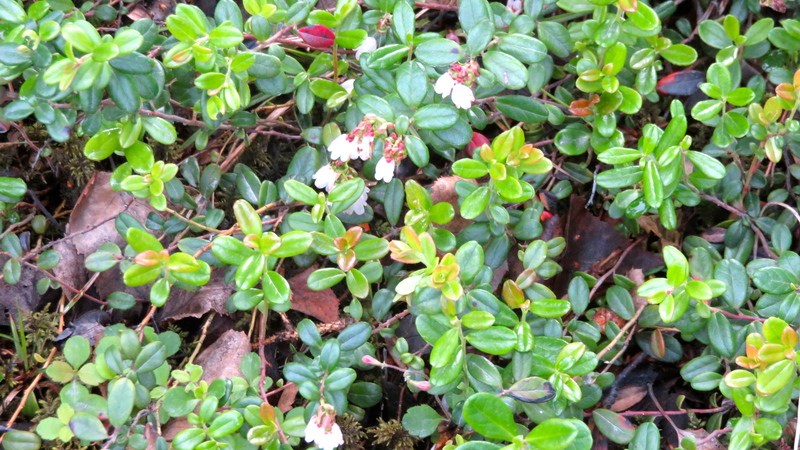 Ah, to be able to speak the language of flowers (and raindrops and snowflakes and angels)! If only I’d been able to linger for an hour perhaps it would have been possible. But you can’t hang out too long in this forest before you’re drained dry by predators, and the mosquitoes were already nipping at my face, my hands, the back of my neck. 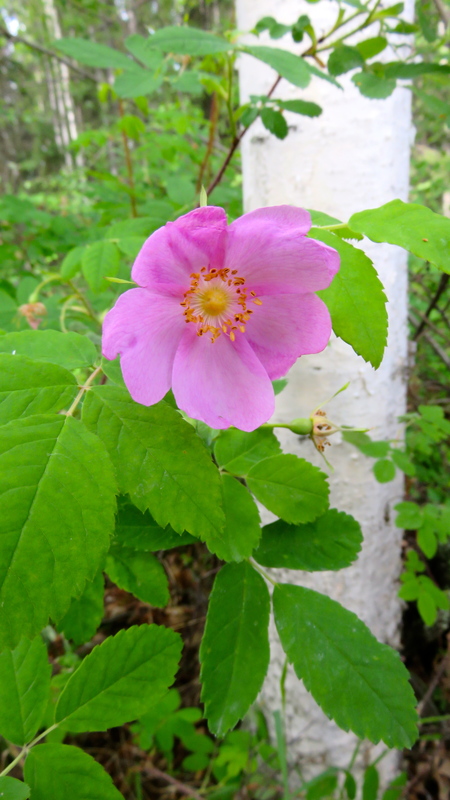 I took off, fast, and was nearly home when at the edge of driveway, I came upon a solitary wild rose singing an aria in pink to a white birch. The way she leaned against him, so sweetly! She melted my heart and I’m sure his, as well. Thank you! Thank you! I’m good now Mama Nature! I thought as I climbed the stairs to our deck. 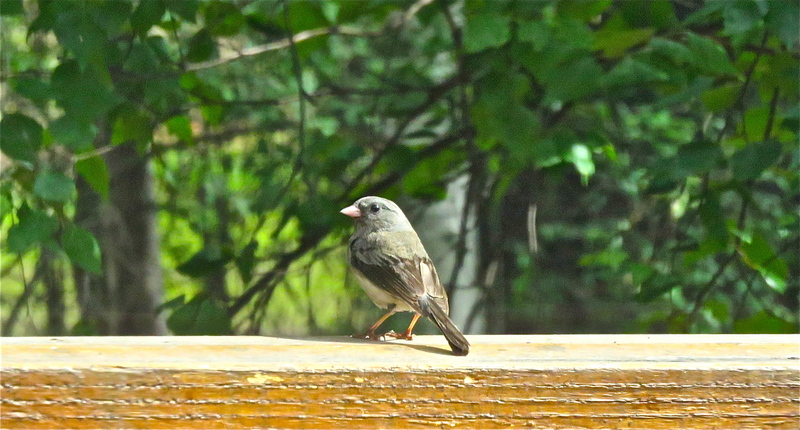 But just to make sure I was 100% de-funked, or maybe because my mama loves grand finales, a dark eyed junco was perched on the top railing, singing her heart out. Just for me? Lovely. Glad you found solace and inspiration. I love Mary Oliver too. And nothing like nature to put life in perspective sometimes. Nature and bicycle rides? And our grandkiddies? Thanks, Lisa. Such a beautifully written account of your slump, my dear S. I’m sorry I couldn’t be there to comfort you with bear hugs and love. Still, Mother Nature did what I couldn’t be there to do. It’s not surprising, in the silence of the forest, that the trees and flowers and berries speak to us in times of need; I expect that M. N. knows only love and she is so willing to share. I’m so happy you’re flying above the indigo now. Also, such good photos! I can’t wait to share with you a lovely video of our back yard with singing robins and raucous crows squawking in the early hours of the morning yesterday. I would send it, but a video is too large to email unless it is <20mb (about 1 minute). When I read this I thought of a poem I ran across the other day that I like very much. It’s called The Peace of Wild Things by Wendell Berry. I think those of us who find healing and rejuvenation in nature are especially blessed. Thanks, RP. I couldn’t agree with you more about being blessed. I will check out Berry’s poem. Best to you. Found it! So fitting. Thank you, RP. cool story–can i call it that–a story(? )—with a protagonist,…on a hero’s journey–out and into the great beyond–challenged by turmoil, determined to flower or flourish despite it all–finding meaning and salvation within her grasp, where she happens to be–empowered by such discoveries–re-engaged she is by the familiar now clearly seen to be extraordinary? Hola jd. Thanks for your remarkable comment. Story? Maybe a story or a piece of one, a flash in the frying pan of life. This is, perhaps, what you and I have in common, being both caught up in the Great Evershifting Message, tumbling presumably toward the Light, through a crazy cosmic interplay of sensory information and language that must, above all, be shared. I truly believe that Mother Nature provides a much larger context for the substance of our lives. She never fails to lift my spirits. I’m so glad she was able to lift yours! Beautiful, Susan- as always, your joi de vivre inspires! Those days when moods consume, are so unexpected some times, but like you, nature always frees me. I’ve missed your stories! Thanks, Dawn, and I have missed your stories, as well. Are you spending much time in nature lately? The Ham is such a fine place for us to be out in it! Not as much as I’d like… just feeling a bit stuck. I’m hoping to work through this block soon! Yes, the Ham is a very special place indeed! Dawn, don’t know if this is applies to you, but for me getting stuck is often connected with either not having enough alone time to write or being too busy doing non-writing socializing. True, routine is important in establishing a habit (which is why NaPoWriMo works for poets), but sometimes we writers just need to be alone (walking along a beach or river, sitting on a rock, hanging out in the corner of a coffee house or in the zocolo of a Spanish village, always with journal and pen in hand (or computer). Solitary experiences seem to attract one’s muse and give birth to inspiration. May your muse return from her vacation soon. Thanks so much, Christine. There is joy to be had here in this life if we are open…as you know, dear meanderer. 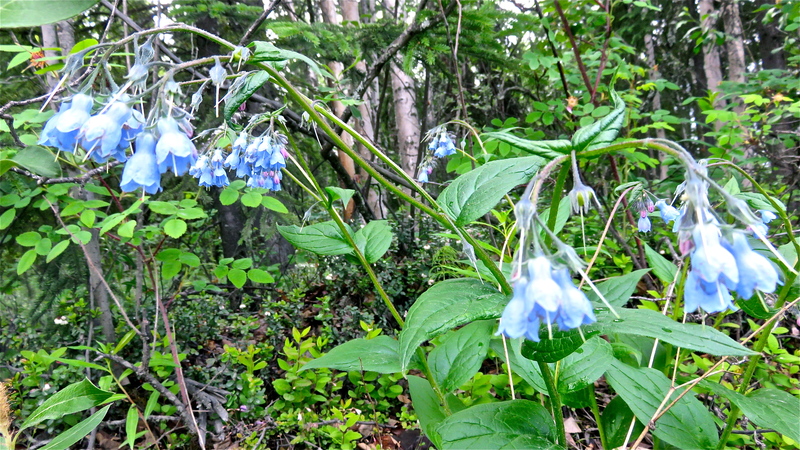 The beauty of your visions and connections brings your walk to life with delightful, celebratory joy – to hear the silent blue bells ring, and the dwarf dogwoods barking like sled dogs. Thank you for sharing such enduring lovely images.